This proved to be the most elusive of all the tapes. In many ways, “History” exists as a key crossroads for Headshots/Rhymesayers. #1)It’s the first tape that is focused on a collection of 4 tracks demo recordings from the crew, rather than the collection of freestyles and live show footage that was the foundation of the previous tapes. #2)It’s a turning point within the crew as well. By the time tape #5 came about, some of the crew had moved on to pursue their own music ventures. #3)On a personal tip, it’s the last release on Rhymesayers before I connected with the crew, so I indeed only heard it as “History” and never in the present. Although, it’s called “History”, it’s just as effective in giving a glimpse of the future. You can clearly tell the crew is getting a better grasp on song-writing, arrangement, concepts, and things of that nature. The raw B-boy essence is still in effect, but they’ve injected more musical savvy in to the mix. The result is a 17 powerful 4-tracks tapes, produced by ANT, 1 live performance, and a collection of freestyle interludes. 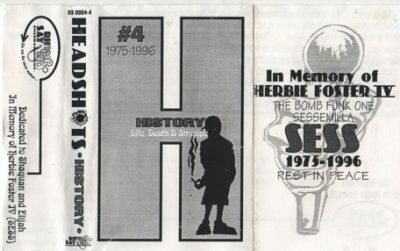 Of course, you can never speak on “History” without acknowledging the fact that it was released “In Memory Of” Headshots member, Sess, who passed away earlier that year. The tape features dedications to Sess thru out, which are connected to interludes that showcase his freestyle skills. This tape also is the first to bare the Rhyme Sayers Name and original logo. Oh yeah, Slug did the artwork too… R.I.P Sess. comment "Headshots – Vol. 4: History (Cassette) (1996) (320 kbps)"